WordPress just sent the annual report about SWPAS’s views and where they came from and the site’s most popular posts in 2015. SWPAS got 350,000 views with the busiest day (surprise!) December 18. The most popular post of 2015 was the TFA Open Thread/Reax on December 18. #2 was the “Prequel Fans Have Heard The Dog Whistle” post in July, #3 was the post about Lucas’s interview with Charlie Rose in November, #4 was the post on Anthony Daniels’s comments on the prequels, and #5 was basically an impromptu open thread about the goings-on at Celebration Anaheim back in April. The top referring sites were Facebook and starwars.com. Most visitors are from the U.S., the UK, and Canada. Finland, Germany, Slovakia, France, Spain, Australia, Brazil, Norway, Sweden, Russia, Poland, Mexico, New Zealand, and Vietnam are representing in strong numbers. I am however amazed at what other corners of the Earth prequel fans are lurking: Kazakhstan, Burkina Faso, Mongolia, Cambodia…it’s crazy. To my readers in Syria, Afghanistan, and Somalia, stay safe out there! I need all of the eyeballs I can get! The top five commenters for 2015 were Stefan Kraft, Susan Bowes, Adam D. Bram, Hunk A Junk, and andywylde77. And now for what’s in store for 2016. Regardless of how you feel about TFA, SWPAS is a pro-prequel site for anyone who loves the prequels, period. I let people say their piece in the open discussion thread and thankfully it didn’t turn into WWIII. I wish I could say the same about the Facebook page, where I’ve had to ban several trolls over the past week or so and even delete a post because it was getting out of hand. If you ever wonder why I have a low opinion about other fans, try getting called an a–hat on Christmas Eve by a total stranger. I am considering starting a separate SWPAS discussion group that’s members only. In any case though this is about celebrating the prequels and promoting them and I hope fans of all stripes feel comfortable here. I also have in mind a project that I will announce soon. The SW Prequel Frames Tumblr has posted a series of fascinating articles about TPM, AOTC, and other prequel-y things lately (which I’ve just caught up with). Bryan Young posted on How Stuff Works the 10 Times TFA Nods The Star Wars Prequels. He said in a comment on another FB page that he had to narrow it down from 20. Go figure! I mentioned back in November Susan Bowes’s plans for a fan appreciation video for George Lucas and his work on the prequel trilogy. She has moved the deadline to mid-January, so there is still time to get a video clip to her. Her e-mail address is susanbowes@optonline.com. I’m fine with moisture evaporators and trade talks but I see his point ;). Charlie Rose’s YouTube channel posted yesterday some video of his interview with George Lucas. They’re relevant when you connect it with the tweets. Check out this amazing Anakin t-shirt…there’s a second Anakin design, plus designs with other prequel characters and characters from all of the other SW films. Only twenty bucks. Thanks to LadyJediScientist for finding all of this stuff on Etsy! Another trait that Anakin Skywalker and Homura Akemi share is that over their story arcs, they become more selfish as the story contnues. In The Phantom Menace Anakin selflessly gives to Padmé, Qui-Gon and Jar Jar without any thought of reward. In Revenge of the Sith, Anakin selfishly tries to save Padmé because it’s not about her, it’s really about him. I ordered a copy of this new Star Wars “adult” coloring book, which is some kind of new trend. The book is actually a hardcover, not the soft heavy paper covers you normally find with kiddie coloring books. As the title says there’s at least 100 line art images of characters and symbols from Eps I-VI. Some are kind of simple, others are really elaborate and getting some of those colored with regular ol’ Crayolas or markers would be kind of challenging. A lot of the pieces are unique, while others are older line art mixed in with new elements. Art nouveau and mandalas seem to be the most common styles. A lot of the art is beautiful. An enterprising and skilled fan could photocopy one of the images, color it, and scan it to use on “personal” items like t-shirts or mugs or whatever. I think there’s a fair representation of the prequels in the book. After all, it’s probably the only place you can find an art nouveau rendition of Sebulba or Jar Jar. Art supply stores like Michaels or Aaron Brothers might have it in stock. Otherwise you can order it from Amazon, Walmart, and other fine retailers. 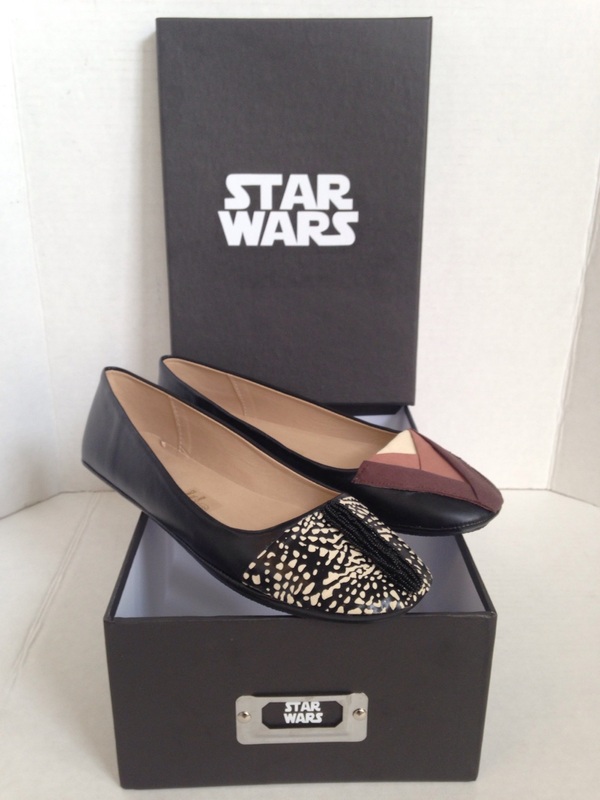 Via Death Star Doll on Etsy.com, I recently had a pair of flats custom-made with an Anakin and Padmé theme. One shoe is inspired by Padmé’s dress in the dinner/fireplace scene in AOTC and the other inspired by Anakin’s Jedi robes.